Political headlines and trade fears are dominating the headlines in today’s North American session, leading to a slight risk-off tone despite a positive open for risk assets. As a result, we’ve seen the US dollar, Japanese yen, and Swiss franc ascend to become the strongest major currencies on the day after bringing up the rear through the first four days of the trading week. 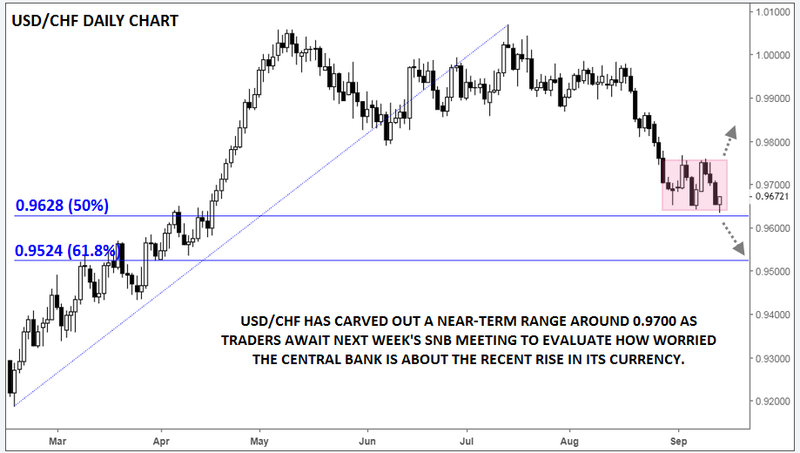 One of the more interesting pairs to watch in the coming week will be USD/CHF, which we highlighted as vulnerable to a positioning-driven reversal two weeks ago. Rates have continued lower to test the 50% Fibonacci retracement near 0.9630 early in today’s trade before bouncing back slightly as of writing. Over the last two weeks, the unit has carved out a range between support near 0.9630 and near-term resistance around 0.9760. Next week brings one of the Swiss National Bank’s quarterly monetary policy meetings. The confab will be interesting not necessarily for the changes to actual monetary policy (which has been on hold for years, with no change remotely likely at this meeting), but for the central bank’s rhetoric around the value of the Swiss franc. After the SNB removed its cap on the franc in January 2015, it described the currency as “significantly overvalued” ten consecutive times, at EUR/CHF levels varying between 1.05 and 1.10. Since EUR/CHF rose (reflecting CHF weakness) toward 1.15 for the September 2017 meeting, the SNB has categorized the value of the franc as merely “highly valued.” On the eve of next week’s meeting, EUR/CHF is trading at a 1-year low of 1.1250, with USD/CHF at a 5-month low of its own near 0.9670. In other words, the SNB could increase the intensity of its jawboning next week by once again describing the franc as “significantly overvalued,” which would raise the risk of intervention in the coming months. Of course, if you were to look up the definition of a “neutral country,” the top example would be Switzerland, and SNB Chairman Thomas Jordan will be loath to invite criticism as a “currency manipulator” from the trade-obsessed Trump Administration, but the if the franc continues to gain ground, as we suspect it may, Jordan and company may have no choice. 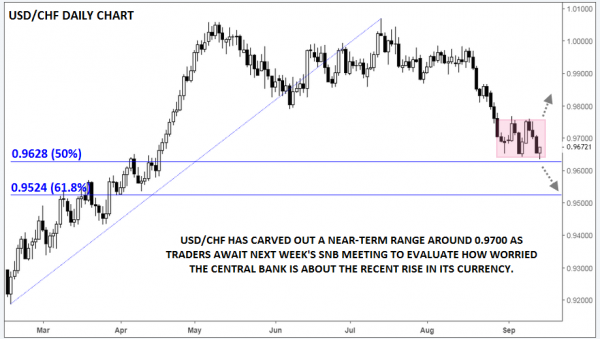 In any event, traders will closely monitor the 0.9630-0.9760 near-term range for a break in the wake of the SNB meeting as a possible indicator of near-term momentum.